In the language of the Elder Days, 'Arda' signified the World and all that is in it. Arda was created through the Music of the Ainur to be a dwelling place for the Children of Ilúvatar (that is, Elves and Men). Originally a flat world, the continents shown in the map above were surrounded by a mighty ocean, Ekkaia or the Encircling Sea, and separated by Belegaer, called the Great Sea. In the First Age, the regions to the north and west of Middle-earth was occupied by the country of Beleriand, but this was destroyed during the tumults of the War of Wrath. In the Second Age, the isle of Númenor was raised in the Great Sea for the Edain to dwell on. 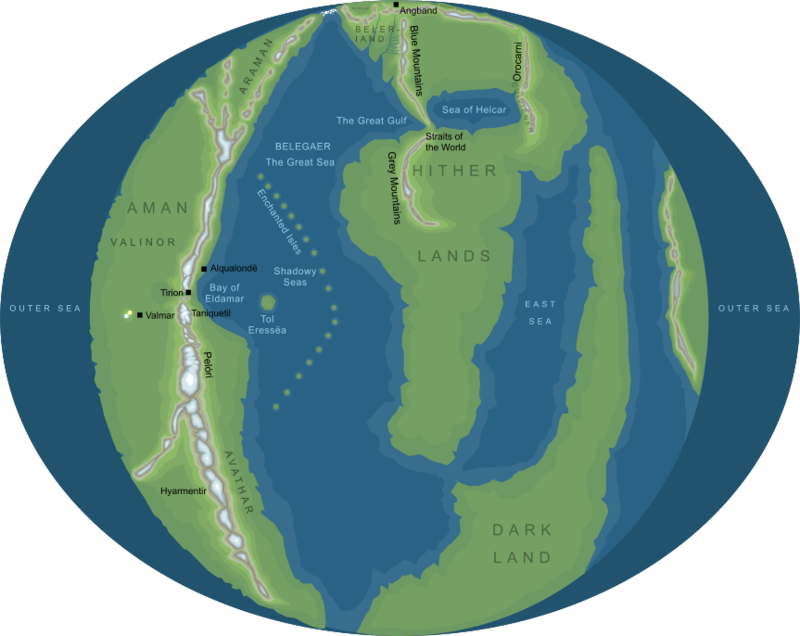 This island existed through most of the Second Age, but was destroyed in the Downfall of Númenor as a result of the pride of the Númenorean people in defying the Ban of the Valar and sailing to Aman in the west. After the Downfall, the shape of Arda was changed, and it was made 'bent' (or 'round' as we should say in modern terms). Aman was taken out of the world, and could only be reached by the Elves, following the straight road that was granted to them. As Aman was taken away from Arda, new lands and continents were created. From the late Second Age onwards, the World began to take the shape that we know today. The map of Arda shown here is based on Maps IV and (especially) V reproduced by Christopher Tolkien in volume IV of The History of Middle-earth. These maps belong to an early phase of Tolkien's mythology, and in a few cases the nomenclature of the originals has been updated (for example, Map V refers to the region known in the published Silmarillion as Avathar by its older name Arvalin). The main point of conjecture on the map is the placing of the Ered Luin and Orocarni. In fact, Map V does not name these mountain ranges, but Map IV shows ranges in these locations, and labels them the 'Blue Mountains' and 'Red Mountains' respectively. Equally, the range stretching southwest from Helcar into the (unnamed) southern continent might possibly correspond to an older conception of a range known as the Grey Mountains (quite unrelated to the northern range of the same name). It's important to remember that the original maps on which this one is based predate the stories of the Third Age, and aren't entirely compatible with the later geography of Middle-earth. In particular, the relatively small northern continent would probably need to be rather larger than is shown here to accommodate all the lands that Tolkien later devised.